Practice, they say, makes perfect and when it comes to shooting and accuracy, practice is the only way to improve accuracy. Regardless of your shooting goal, accuracy is important. That is why shooters use targets to hone both their skill in handling a gun and their accuracy. To that end, there are three popular types of targets that shooters use. Those are steel targets, Tannerite targets, and plinking targets. Here is a look at each of these targets and why you’d use them. Steel targets are made out of 1/2 inch or 3/8 inch steel. Many people opt to use armor grade steel. The fast-and-hard rule is any steel will do if it has a Brinell hardness in excess of 500. Of course, this is subjective but applying it adds longevity to your targets. The benefit of using steel targets is that they last longer and require fewer houses for setup since they can be used over and over. They are also easy to clean up and usually just require repainting when it matters. The advantage of using steel targets is that you can hear that “plink” if you hit one. This allows the shooter to have instant confirmation during target practice. The downfall with steel targets is that they pose a ricochet risk and people do get injured from bullets that ricochet. 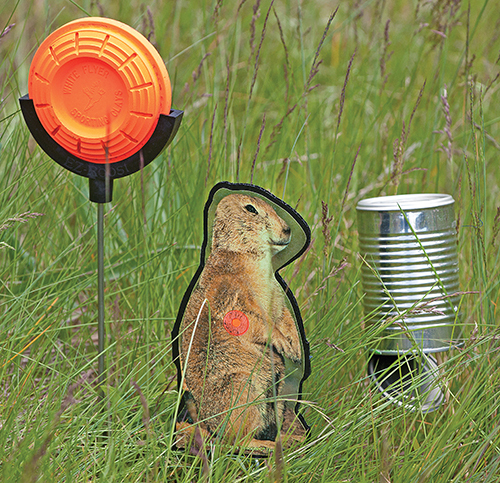 Steel targets are usually easy to move around so you can gain more detailed target practice in a small space. With the right tools, steel targets are easy to make as a DIY project. Tannerite targets are exploding. They are a mixture of aluminum powder and ammonium nitrate. The ratio for mixing at home is 5:95 Aluminum powder:Ammonium nitrate. While this already sounds like a bad idea, the mixture only explodes when struck with a bullet. The bigger risk is that the target may cause a fire. That is usually from mixing the ingredients wrong, or exposing them to flames. 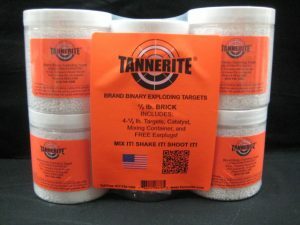 Tannerite targets are helpful for long-distance shooting where you might not hear the plink. You will definitely see the explosion. The downside is that they are a once-use product and they create a mess. While the current laws allow Tannerite targets for use and sale in all 50 states, it is best to check with your local authorities for changes to those laws. Plinking Targets are comprised from almost anything from tin cans to watermelons. 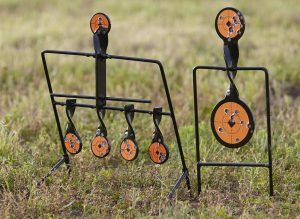 These targets offer an affordable means to hone your shooting skills and accuracy. You can easily create larger targets using cardboard cutouts or difficult targets using Q-tips. If you want to add technical challenges, many plinking targets can be swung from a rope to provide a moving target. The benefit of plinking targets is that they are scalable for different skill sets. Depending on the material from which the target is made, these may be single use or last for years. The list of material that you can use is virtually limitless. Another advantage to plinking targets is that they add a sense of fun to the game of target practice. It is easier to convince a new shooter to practice target shooting if the idea is to demolish a watermelon or perhaps to challenge them by taking a grape off a toothpick at 50-yards. Every target has its strengths and weaknesses. The idea is to learn when to use each type of homemade target to gain the best benefit. Your goal as a shooter should always be gun safety followed by bettering your shooting skill and accuracy. Each set of target types also provides a wide range of costs. These three choices allow you to pick a cost that fits your budget.